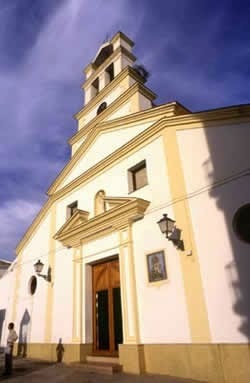 Mollina is a small inland town of 3,500 in the middle of Málaga province, 15 KM north-west of the city of Antequera. It can be very easily reached since it’s situated right at the A-92, the motorway connecting Málaga with Seville. On the lower slopes of a Sierra, it is a village set in perfect olive and cereal country. If you look at the photos of Mollina in Google, you see it’s a truly typical Andalucian village, one where you’d wish to stop for a coffee right now. First inhabited in Neolithic times, the village faded away and only became inhabited again in the 16th century. This was the result of the Reconquista on the Muslims, and land being handed out for free to the victors. Because of the fertile land, it was a good reward which was used forfarming, in the shade of a convent rather than a fortress. Today Mollina is a peaceful town that is usually visited because of the annual wine festival in September, the proximity to Antequera, which has become a real tourist destination, as well as to ‘Fuente de Piedra’, the natural reservation known for the thousands of flamingos that arrive here from Africa, to breed and return in September. What is a property specialist doing in Mollina? For our aim, offering property in inland Andalucia, it’s the perfect location. For Antequera, and its surroundings, are one of the most popular areas for anyone looking for property inland. Being only half an hour away from the Costa del Sol, it is both far enough to be in a different, ideal world of greenery, calm and the real Andalucia, as near enough to still be able to jump in the car when you are in for the life, events and amenities of a cosmopolitan area. When looking for properties in Mollina, or the whole of inland Andalucía for that matter, Antequera is that epicentre where most people start. You find our office in the Calle de la Villa, which is in the centre of Mollina and near the Caixabank. Thank you for your visit and see you in Mollina!